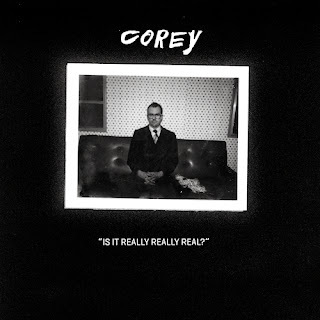 Corey Cunningham from Terry Malts on the west coast has taken that projects fuzzy pop punk direction and narrowed the focus in this solo debut on Loglady Records. The energy and fuzz has been thrown into those tar pits to struggle in slow motion as a direct descendent of Jesus and Mary Chain's detached echo. The Malts have a new one from Slumberland and this solo effort illuminates the core of that garage four piece. A-Side "Is it Really Really Real?" breaks into an ominous hum with a kick and downstroke of a low end gutter guitar like Harvey Milk only to double time the rhythm with mechanical sounding drums and that guitar winding up into the higher register distortion. Corey just barely develops a melody because the echo and fuzz banishes him back in the studio enhancing those hard edge relected soundwaves. Like the tracks on Barbed Wire Kisses you get out the dance metronome and create a cool unfeeling sound with layers of shoegaze that uncomfortably fast percussion. Corey's hitting that contrast of fast and mopey and it's is where this track gets into character. Slow or fast? Sad or happy? Corey's looking for that space between. B-Side's "Out of Limits" has a high hat panning hot across channels in this familiar frantic, nervous feeling beat out of what would otherwise be just fast. Uncannily in the Reid's camp vocally, the stutter guitar and drum machine rigidly sticking to the script with the vocals in front of this mix under piles of echo in that sunglasses leather jacket feel. Insane guitar meltdown, not a solo, just playing it like a robot seizure. Very cool and the details are where this gets crazy going as far back as to pick up those industrial torches from Pigface. "Come on Let's Go" captured huge guitar strikes and the drums are in the cavemen stomp beat, singing at the same pace, the lines about caring or love have the same lack of passion that gang of four has for tourists. Pick this up from LogLady Records on purple marble with a punch out inner 45 hole - for my jukebox.